1. Heat the oil in a medium pan, and cook the onion, celery and carrot together for 5 minutes until softened. Add the garlic, bay leaves and saffron, and cook for 1 minute. Stir in the chopped tomatoes, fish stock and wine. Bring to the boil and simmer for 10 minutes. 2. Meanwhile, make the pesto. Place all the pesto ingredients in a blender and pulse to make a thick paste. Season and set aside. 3. Add the cubed cod to the pan. Simmer gently for 3-4 minutes, then add the seafood, bring to the boil and simmer for a couple of minutes until everything is cooked through and piping hot. Check the seasoning and discard the bay leaves. 4. 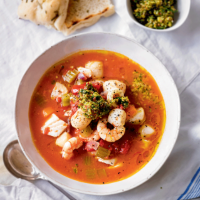 Serve the stew in warmed bowls with a spoonful of the pesto on top, along with salad and chunks of good Italian bread such as focaccia.